Azerbaijan: Another stadium of Beşiktaş… on the Caspian Sea?! Just like some Arab countries, Azerbaijan is on a spending spree with several megaprojects underway. As we recently reported, the new Olympic Stadium is ready for formal proceedings before opening and it was built on land reclaimed from a local lake in Baku. A much larger operation is ongoing 25km south-west of the capital, where roughly €100 billion is to be spent on Khazar Islands. A complex of 41 artificial islands will create a new super-city, enclave of wealth. It will include the Azerbaijan Tower, building over 200 meters taller than the Burj Khalifa in Dubai. One of the islands is to hold a football stadium (you may see it in the lower right corner of this initial rendition). And the company running Khazar Islands project paid a visit to Istanbul recently, talking with Beşiktaş about using its stadium design. Avesta president Haji Ibrahim Negramli negotiated with club president Fikret Orman and informed about reaching a preliminary agreement about a second stadium with this design being built in Khazar Islands. It certainly will be altered, though. 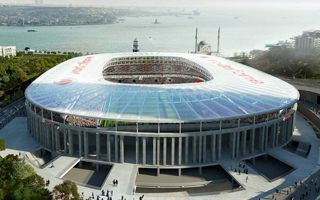 If not for aesthetic reasons, then surely for structural ones as the Turkish original stadium is being built in unique geological and urban conditions.